Some sidewalk chalk, orange cones, and raised platforms were enough to dramatically calm traffic. 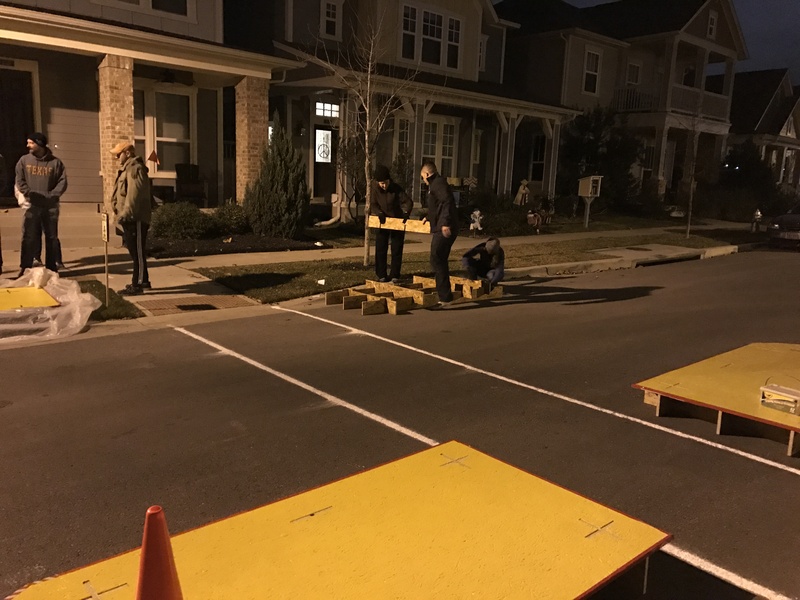 A group of neighbors worked together to install a temporary traffic calming measure on McBee Street at Ruiz in Austin’s Mueller neighborhood for one day — the last day of 2016. For that one day, the crosswalk was “painted” a vibrant peach color (with sidewalk chalk), the curb was extended from the south side with a four-foot-wide “Conway Bulbout” (two pieces of plywood each), and pedestrians found refuge in Ben’s Island in the middle of the street (the “Sadia Pedestrian Island” – two sheets of plywood each). The changes narrowed the traffic lane to 10 feet at the point where drivers might interact with pedestrians. One of the neighbors, Marko Garafulic, shot video of people driving through the tactical urbanism treatment on New Year’s Eve and compared it to video of the street in its typical state. He then estimated travel speeds, and the difference was astounding. During the demonstration, most people drove between 5 and 15 mph — speeds at which collisions and serious injuries are very unlikely. The next day, without the makeshift traffic-calming, most people drove between 23 and 30 mph — speeds that carry much more risk, especially for pedestrians. Tactical urbanism has some history in Texas. The Better Block project, which started in Dallas, was an early catalyst of the movement. Better Block now provides WikiBlock, which contains do-it-yourself instructions for building various low-cost street enhancements, from traffic calming devices to benches to a full neighborhood bar or coffee shop. Setting up the tactical safety intervention. The City of Austin conducted its own Burnet Better Block Demonstration event in the fall to show how coming design manual changes will make “streets safer and more comfortable places to walk.” Austin has also been using efficient street treatments to do rapid interventions, including the beautifully done polka dot bulb outs at one intersection and using bollards to quickly fix a dangerously designed U-turn on South Lamar. But so far, Austin does not have a formal process for residents to legally test out their own street safety interventions. The residents of Mueller have proposed, tested, and documented the safety benefits of their treatment where they know it will be most helpful for their kids, but technically, they may have broken the law. Neighbors report that an Austin Transportation Department-marked SUV drove very slowly through the intersection during the demonstration, but did not stop to talk, and the city has issued no response. The city could establish a simple set of guidelines to unleash the traffic calming instincts of Austin residents — a framework for neighborhoods to use tactical urbanism to safely suggest improvements exactly where residents think they need to go. In Burlington, Vermont, for instance, the city has published a “Community-Led Demonstration Project Policy + Guide” that includes a process to get approval from the Public Works Department to go ahead with tactical urbanism projects. Most importantly for the residents of Mueller, they hope the city will work with the neighborhood developer to implement their ideas. There is a strong chance they will get their wish, with Austin recently adopting a comprehensive safe design speed policy that includes a plan to create pilot slow zones. It seems the Mueller neighbors are ready to help the city and the developer show how much better a neighborhood street can be when it’s designed for safe driving speeds.